Segmental concrete pavement product sales in the United States and Canada increased for a seventh consecutive year, hitting an estimated 750 million square feet, or 2.5 percent higher than 2016, according to the Interlocking Concrete Pavement Institute 2018 Industry Sales Profile. 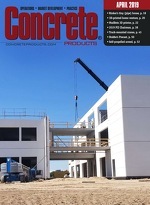 "The demand for traditional and new segmental concrete pavement products continues to increase," says ICPI Chair Kendall Anderegg (Mutual Materials). "In fact, both residential and commercial sales grew because many homeowners, businesses, and government officials realize that no other pavement system offers the durability, design flexibility, sustainability, long-term cost-effectiveness, safety and appearance like concrete pavers." Last year’s volume marks a 63 percent increase from the 472 million square feet level the industry recorded at a 2010 trough, and indicates near-term potential for reaching a record 800 million square feet in 2006. The 2017 figure equates to combined U.S. and Canadian paver use of 2.07 square feet per capita, up from the prior year’s 1.94 sq. ft. Ohio-based researcher Industry Insights compiled the ICPI Sales Profile from a survey of 26 paver and hardscape producers, whose 136 machines represent about 54 percent of U.S. and Canadian market capacity. Year-over-year sales growth was 2.8 percent in the U.S. and 0.2 percent in Canada among survey participants. Products for residential use represented 77.9 percent of sales, while commercial applications comprised 12.5 percent of sales. Public/government and industrial sales were 8.2 percent and 1.4 percent, respectively. Interlocking concrete pavers comprised 81.3 percent of products sold by survey participants, while paving slabs were the second-most popular product at 10.2 percent. Permeable interlocking concrete pavers represented 5.8 percent of sales, followed by concrete grid pavers at 0.4 percent and other products at 2.3 percent. The 2018 ICPI Sales Profile attributes low interest rates and energy costs, modest growth in new home construction, increased infrastructure investments by the public sector, and commercial construction gains as key contributors to growth for the U.S. segmental concrete pavement industry. Canada presented a mix of growth or contraction depending on the region. Profile authors cite the lack of a sufficient labor force for segmental pavement installation as attenuating factor in industry growth, but acknowledge the difficulty of measuring the metric’s impact on sales. "While ICPI continues emphasizing programs that will spark sales, we are also focused on the workforce challenge our industry faces," Anderegg affirms. "Three of every four contractors who have participated in recent studies by ICPI have indicated that their top business obstacle is recruiting and retaining qualified employees. We are creating a program to attract young people and teach them the skills they need to succeed in installation and hopefully manage a contracting business someday." The ICPI 2018 Industry Sales Profile is available for purchase at www.icpi.org/shop.